JEA “specifically declined the invitation” by the Baker BOCC to come talk about EZBase, a road pavement material made from coal ash, and spread on roads and parking lots in Baker County, Florida. FDEP accepted an invitation and will present this Tuesday. The Baker (FL) BOCC and Mark Lyon invite everyone to that meeting. Photo: Michael Rivera, of Baker County, Florida, Courthouse. Most of Baker County, including its county seat Macclenny, is in the St Marys River watershed. However, south along FL 121 before the Union County line on the way to Fort Butler, part of Baker County is in the Suwannee River Basin, and we don’t know whether EZBase may have been spread on roads there. Plus JEA shipped coal ash from Jacksonville to the Veolia Pecan Row landfill in Lowndes County, Georgia, which is in the Suwannee River Basin, a quarter mile uphill from the Withlacoochee River and in a Floridan Aquifer recharge zone. While environmentalists everywhere are celebrating North Carolina DEQ’s Order for Duke Energy to Excavate Coal Ash at Six Remaining Sites, let’s remember the decision for each of those six sites was “Movement of coal ash to a new or existing lined landfill”. We don’t want Duke or JEA or other coal ash in our landfills or “recycled” as EZBase and spread on roads. The utilities that created the coal ash should have to bear the expense of disposing of it safely on their own land. This entry was posted in Coal, FDEP, River and tagged Alapaha River, Baker County, Baker County Press, coal, conservation, Department of Environmental Protection, Duck Pong, EZBase, FDEP, Florida, FPL, Glen St. Mary, Gulf Power, Jacksonville Electric Authority, James Bennett, JEA, Kennie Downing, lime rock, Macclenny, Mark Lyons, mercury, Mike Anderson, NextEra, north Florida, parking, pavement, Plant Scherer, river, road, south Georgia, St Marys River, Suwannee Riverkeeper, watershed, Withlacoochee River, WWALS, WWALS Watershed Coalition on April 11, 2019 by jsq. Acquiring lands in a springshed is one of the best ways to protect springs and rivers, and a judge just said the Florida legislature can’t divert funds from that purpose of Florida Amendment 1, which was passed by 75% of the people of Florida. On June 15, 2018, Florida Circuit Judge Charles Dodson ruled in favor of environmental organizations that the land conservation constitutional amendment overwhelmingly approved by voters in 2014 requires funding to be used for land acquisition, restoration and management, not for other purposes. This entry was posted in Law, Quality and tagged 2018-06-14, Alachua County, Alisa Coe, Amendment 1, Baker County, Bradford County, Charles Dodson, Circuit Judge, Columbia County, conservation, Dixie County, Earthjustice, Environmental Confederation of Southwest Florida, Florida, Florida Chapter, Florida Defenders of the Environment, Florida Wildlife Federation, Frank Jackalone, funding, Gilchrist County, Hamilton County, Joe Litte, Lafayette County, land acquisition, Law, Levy County, Lisa Rinaman, Madison County, management, Manley Fuller, north Florida, quality, restoration, river, Sierra Club, south Georgia, St. Johns Riverkeeper, Suwannee County, Suwannee Riverkeeper, Union County, watershed, WWALS, WWALS Watershed Coalition on June 16, 2018 by jsq. 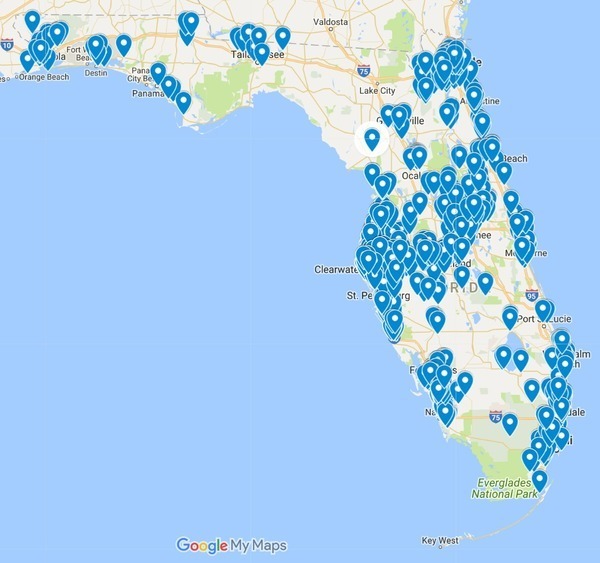 While Alabama is thinking about it (actually, Alabama already does it) and Georgia requires an open records request with slow response, Florida has already required and is publishing timely notices of spills! Among them, surprisingly few in the Suwannee River Basin from Hurricane Irma: three in Baker and Bradford Counties from The Chemours Company, and two from Camp Blanding. Follow this link for the interactive google map. This entry was posted in Quality, River, Weather and tagged Baker County, Bradford County, Camp Blanding, conservation, FDEP, Florida, Florida Department of Environmental Protection, Map Direct, New River, north Florida, notification, pollution, Public Notice of Pollution Act, quality, river, SB 1018, SB 532, south Georgia, Suwannee River, Suwannee River Basin, Suwannee Riverkeeper, The Chemours Company, watershed, Weather, WWALS, WWALS Watershed Coalition on September 29, 2017 by jsq.